Managing a bilingual WordPress website is a bit more work than a single-language site. There are page and post translations, string translations, and menu translations. Depending on your site’s design, you may want to add a link to the alternate language in an existing menu instead of adding WPML‘s language switcher menu. Creating a link to the alternate language’s homepage would mean simply adding it to the WordPress menu, but creating a dynamic link to the current page/post in the alternate language means we need a page-specific URL generated by WPML. There are many approaches to add the link, but in this post, we’ll explore two quick options. This option will automatically add an item to the end of an existing menu, and will do it outside of WordPress, meaning it can’t be managed in the administration console. Change the theme_location == 'primary' to reflect the theme_location your desired menu is using, and you’ll see an additional nav item when you refresh. If you’d prefer to have a bit more control as to where the menu item appears, and the exact text displayed, you can add a custom menu item and replace its URL when the page is loaded. 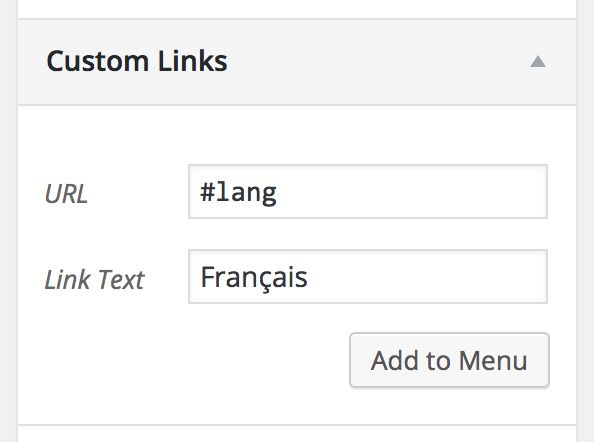 We’ll be looking for #lang as the menu item’s URL, and will display Français in the menu. The URL will be replaced with the link to the page/post in the alternate language, and you can manage the menu item’s text and position in any menu on the site (even more than one at a time).